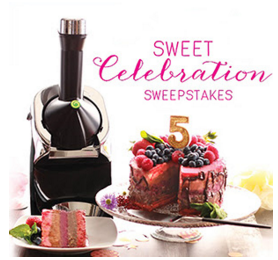 Yonanas® Sweet Celebration Sweepstakes – Win a $500 Visa gift card & more! Win a $500 Visa gift card & a Yonanas Elite! ENTER SWEEPSTAKES HERE – Yonanas Sweepstakes page. ENTRY LIMIT – Limit one (1) entry per email address per day for completing a Sweepstakes entry form during the Sweepstakes Submission Period. ELIGIBILITY – The Sweepstakes is open only to natural persons who are permanent legal residents of the fifty (50) United States, who are physically located and residing therein and who are at least eighteen (18) years of age or older at the time of entry. SWEEPSTAKES ENTRY PERIOD – The Sweepstakes submission period begins on Sunday, May 1, 2016, at 9:00 a.m. Eastern Time (“ET”) and ends on Tuesday, May 31, 2016, at 11:59 p.m. ET. PRIZES – One (1) entrant will receive the Grand Prize consisting of a five hundred dollar (USD $ 500.00) VISA® Gift Card and one (1) Yonanas® Elite with an approximate retail value (“ARV”) of one hundred twenty-nine dollars and ninety-nine cents (USD $129.99) for a total ARV of six hundred twenty-nine dollars and ninety-nine cents (USD $629.99). -Five (5) entrants will each receive one (1) Runner-Up Prize consisting of a fifty dollar (USD $ 50.00) VISA® Gift Card and one (1) Yonanas® Elite with an ARV of one hundred twenty-nine dollars and ninety-nine cents (USD $129.99) for a total ARV of one hundred seventy-nine dollars and ninety-nine cents (USD $179.99).